A part of the “system” they’re selling tells you the exact stocks to trade, and exactly when to buy, hold, or sell. Back in the 1990s there were many toy fads, like customizable miniature race cars, plastic battle tops, etc. When the toys are relatively unknown, their prices are often reasonable or cheap. When the toy craze starts, the price often doubles or triples. When the craze ends, they get sold at discounts since nobody was buying anymore. Stocks behave the same way. When a company is popular or there’s good news (expansion, big projects, etc. ), more people buy their shares and the stock price increases. When there’s bad news like declining sales or worse, people sell their shares and the stock price decreases. When you buy shares at lower prices and sell shares later when the price increases, you profit. When you “short sell” (sell high now, buy low later) and the price decreases, you also profit. For both of those trades, you lose money if you guess wrong. Buy shares now at P100 each and the price decreases to P50, you sell at a loss. When you short sell to earn P100 now and the price increases to P150, you’re forced to buy it at P150 and you lose money. Now… what if you can control the market by manipulating a thousand people – your “subscribers” – to buy or sell when you want them to and profit from your trades…? What if you then advertise your “profit” to attract more “subscribers” who will pay for your “advice”? How much money will you have if you manipulate more people to control market swings and profit from your trades, and you have people paying you to control them and their finances? 1. They advertised their BEST POSSIBLE trades/returns in the video… but they will NEVER tell you their losses. Trust me, they have losses – There’s no such thing as a perfect system. If there was, those who know it will secretly use it to become trillionaires… but that’s not happening, is it? 3. Even if you DO profit, the money you paid to the advisor is a great loss over time. For example, if you invest P10,000 a year on something that earns 5% but you lose 1% due to advisor fees (leaving you with just 4% profit), you’d have P950,255.20 in 40 years. Not bad. But if you learned to invest by yourself on something with 5% returns (because you had no advisor costs), you’d have P1,207,998 in 40 years. If you learned to invest by yourself from a P1,000 book, you could have saved over P250,000 or more. You’re never getting those 40 years back. 4. They keep you stupid. They make you believe they have some special knowledge that nobody else has and you can never understand so you never try to learn. 5. They profit by keeping you stupid. Since you don’t know their “special investment knowledge,” you need to pay them to invest for you or give you tips. You give control of your financial future to somebody else, and you pay them to control your future. Don’t be surprised if they use you to make themselves richer. You don’t need to pay an “expert” to give you a bath or tie your shoelaces because you learned to do that yourself. When you learn to invest correctly, you don’t need to waste money on any advisor. You save money and earn more by doing your own thinking! As one example, try learning about “Value Investing,” a technique initially developed by Benjamin Graham (“The Intelligent Investor ”). It’s used by one of the richest investors in the world as of 2015, namely Warren Buffett of Berkshire Hathaway. Basically, the method is about spotting the best companies when they’re at good prices and investing in them for the long term (years or more) and ignore market temperament or mood. The one I use is “Dividend Growth” from a book by Lowell Miller (Amazon link to his book) which looks for companies that can increase their dividend yields. The only ones that can do that are the stable and good companies/businesses. The investment advisor I mentioned says their “system” is based on value investing, but since their signals make you trade every few months, the added trading costs and more chances of losing trades does you more harm than good. 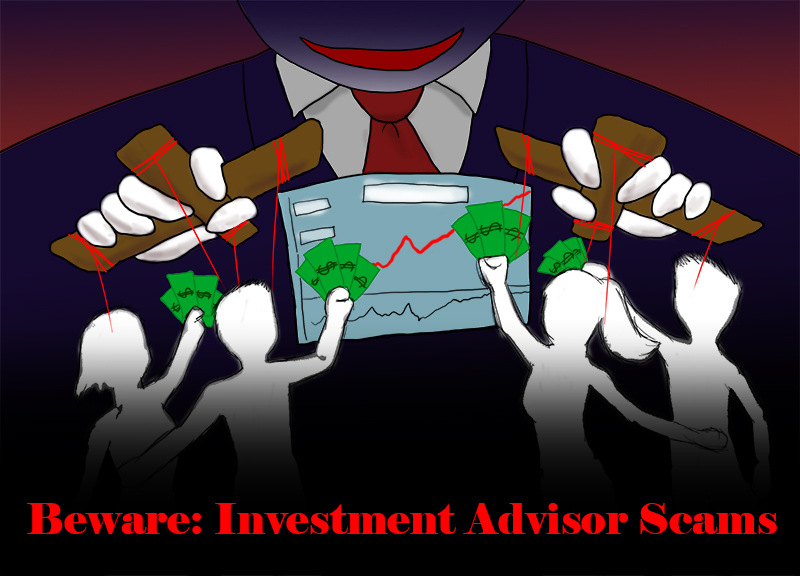 On a side note: Beware of advisors and brokers that make you trade (buy and sell) a lot. Whether you win or lose money, you always pay their fees and make them richer. Long-term investing means you search and invest in a few good businesses/companies a few times (selling only if it’s legitimately failing), and never gambling on price fluctuations every few months. Remember, there are thousands of investors out there who have learned to invest and profit, and they can teach us what they know. They’ve written their “recipes” for investing in books and online articles, and we only need to pay once for a good book to read and learn how to do it forever. My only advice here is that you learn to manage money and invest by yourself so nobody else can take advantage of you. When you see unrealistic returns, scams, or worse, possible criminal activity like market manipulation, you’ll know and avoid it instantly. What are a few hundred pesos for books and a few hours of learning anyway when you can learn to take charge of your own financial destiny? *Note: I will not disclose the TV ad or the business name of that investment advisor. Their website and content are actually very useful and contain many helpful tips (I read it regularly), but it’s just that one product’s feature that I believe seems… “questionable.” The intent is good (maybe), but the capability for abuse seems far too great.